The Birmingham Screwdriver approach, taken by many AV solutions, may not always be the most appropriate approach to eradicating a tough malware problem – a specially designed application which targets specific classes of malware may be a better solution. The following tools have been specifically designed to help skilled users better identify malware infections and then, eradicate (hopefully), those specific infections. These tools require advanced computer knowledge – unless you feel confident in your diagnostic skills, you should avoid them. Just to be clear – not all of these tools are “one-click simple” to decipher, and users need to be particularly mindful of false positives. 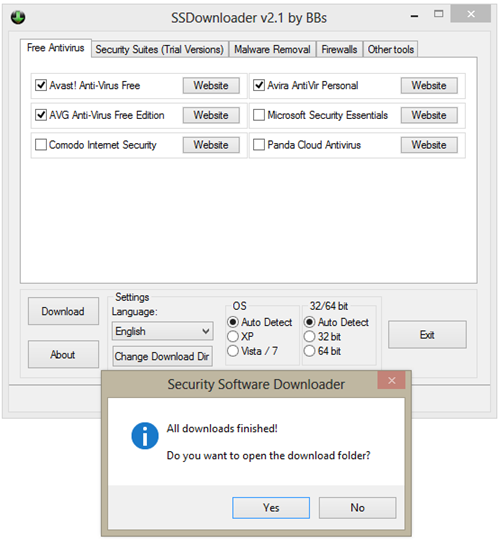 Should you choose to add these applications to your antimalware toolbox, be aware that you will need the latest updated version for maximum impact. Note: Many of the following tools have been tested and reviewed here previously. The program operates as a detailed system analysis tool that can help you in the detection and removal of Hijackers, Spyware, Adware, Trojans, Worms, and other malware. It doesn’t offer live protection but instead, it examines your system, determines if it’s been infected, and then allows you to wipe out the malware. HijackThis is a free utility which heuristically scans your computer to find settings that may have been changed by homepage hijackers, spyware, other malware, or even unwanted programs. In addition to this scan and remove capability HijackThis comes with several tools useful in manually removing malware from a computer. The program doesn’t target specific programs, but instead it analyses registry and file settings, and then targets the methods used by cyber-crooks. After you scan your computer, HijackThis creates a report, and a log file (if you choose to do so), with the results of the scan. BlitzBlank is a tool for experienced users and all those who must deal with Malware on a daily basis. Malware infections are not always easy to clean up. In more and more cases it is almost impossible to delete a Malware file while Windows is running. BlitzBlank deletes files, Registry entries and drivers at boot time before Windows and all other programs are loaded. 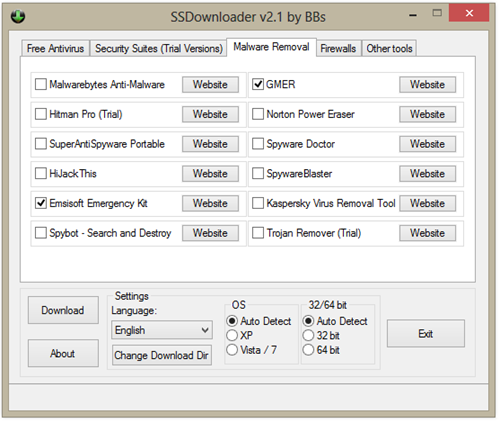 28 special removal tools from Bitdefender. 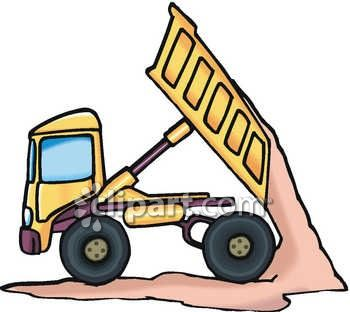 On the page – click on “Removal Tools”. NoVirusThanks Malware Remover is an application designed to detect and remove specific malware, Trojans, worms and other malicious threats that can damage your computer. 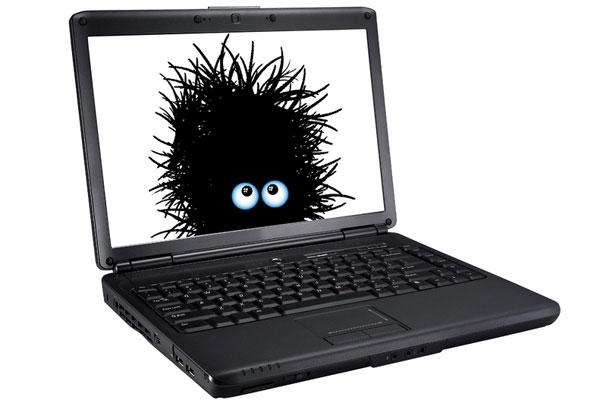 It can also detect and remove rogue security software, spyware and adware. This program is not an Antivirus and does not protect you in real time, but it can help you to detect and remove Trojans, spywares and rogue security software installed in your computer. 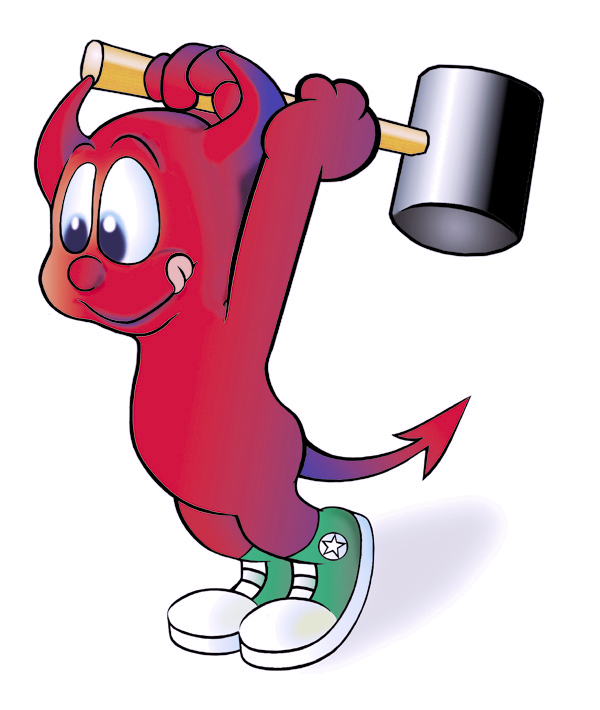 FreeFixer is a general purpose removal tool which will help you to delete potentially unwanted software, such as adware, spyware, Trojans, viruses and worms. FreeFixer works by scanning a large number of locations where unwanted software has a known record of appearing or leaving traces. FreeFixer does not know what is good or bad so the scan result will contain both files and settings that you want to keep and perhaps some that you want to remove. If you think you might have hidden malware on your system, I recommend that you run multiple rootkit detectors. Much like anti-spyware programs, no one program catches everything. IceSword is a very powerful software application that will scan your computer for rootkits. It also displays hidden processes and resources on your system that you would be unlikely to find in any other Windows Explorer like program. Because of the amount of information presented in the application, please note that IceSword was designed for more advanced users. This freeware tool is essentially a combination of Sysinternals’ Rootkit Revealer and Process Explorer. The program can list running processes, modules and Windows services, in addition to scanning for the presence of rootkits. MalwareBytes – In addition to its superb free AV application, MalwareBytes offers a basket full of specialty tools. The following application descriptions have been taken from the site. Malwarebytes Chameleon technology gets Malwarebytes running when blocked by malicious programs. 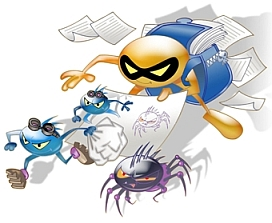 Malwarebytes Anti-Rootkit removes the latest rootkits. RegASSASSIN removes malware-placed registry keys in two simple steps – just reset permissions and delete! This powerful and portable application makes hard-to-remove registry keys a thing of the past. A Rescue Disk (Live CD), which I like to think of as the “SWAT Team” of antimalware solutions – is an important addition to your malware toolbox. More often than not, a Live CD can help you kill malware DEAD! Avira AntiVir Rescue System – The Avira AntiVir Rescue System a Linux-based application that allows accessing computers that cannot be booted anymore. 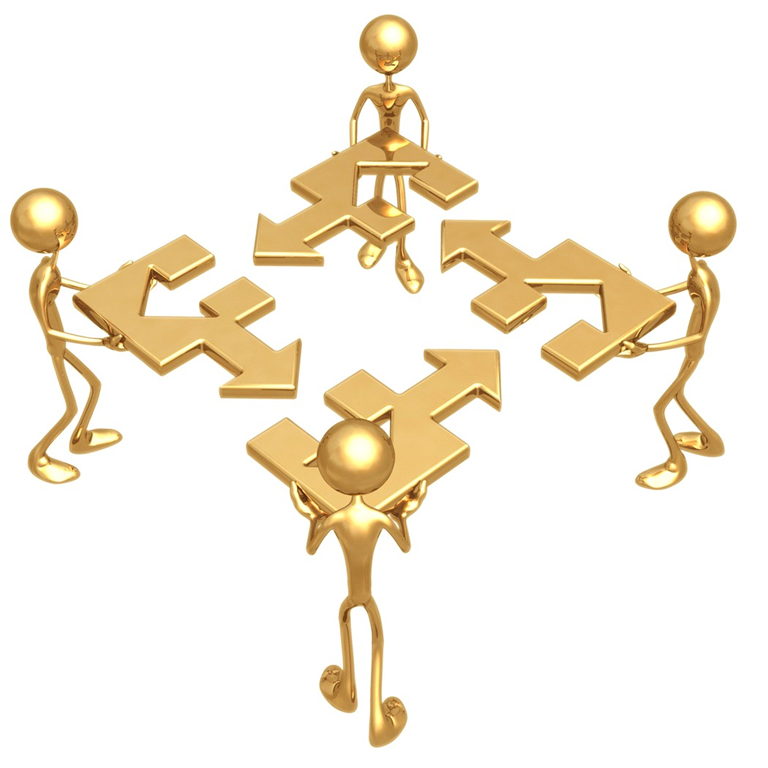 Thus it is possible to repair a damaged system, to rescue data or to scan the system for virus infections. 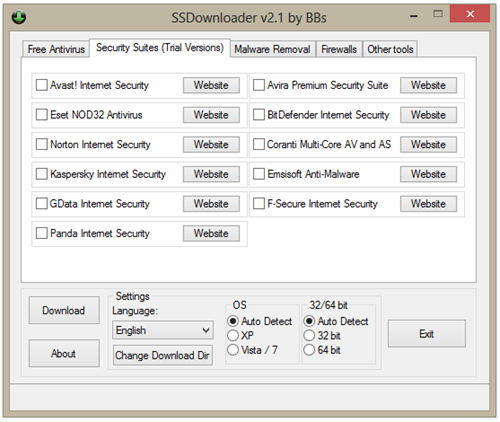 Security Software Downloader (SSDownloader) – now in it’s second edition – is a small open source executable (669KB) – designed specifically as a bulk downloader which focuses on security applications and, security related specialty tools. The tab based user interface (Free Antivirus, Security Suites (Trial Versions), Malware Removal, Firewalls, and Other Tools) is uncomplicated, and checkbox simply. In the first screen grab, referencing “Free Antivirus”, I’ve selected three popular applications for download. Notice the languages which are available, as well as the OS “auto detect” feature. In this screen capture, I’ve focused on two tools which, I know from experience, can get the job done with a minimum of fuss. In testing this neat little tool, I choose a total of 10 applications for download – and, the task was completed in just over 5 minutes. Note: The default download location is the Desktop. You will however, have an opportunity to select an alternative location. 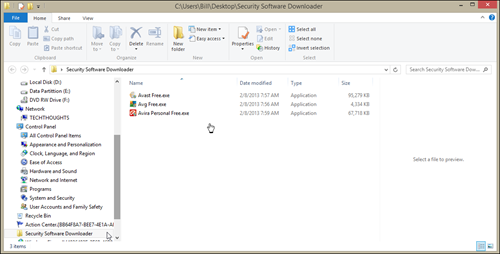 Download the most popular free and paid security software with a single click. The latest version of the selected applications will be downloaded. System requirements: Windows XP, Vista, Win 7 (32 bit and 64 bit). 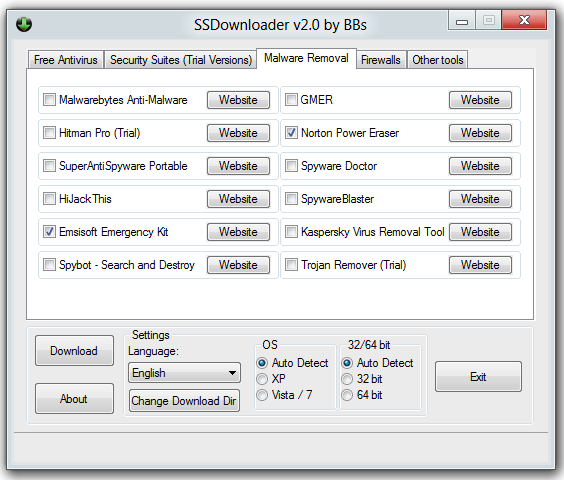 In my estimation, SSDownloader is a terrific portable tool. 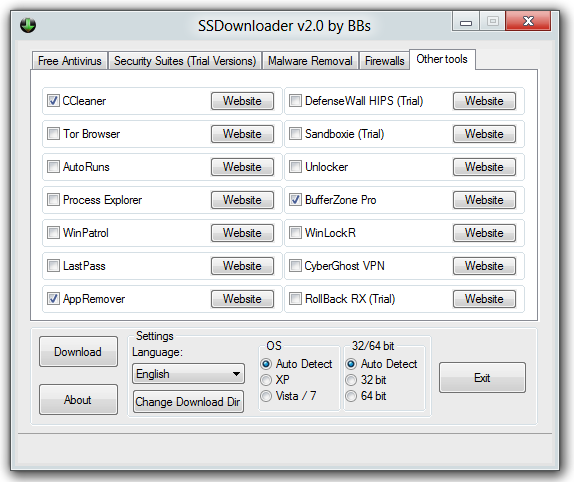 For those of us who are geek inclined, SSDownloader (especially given its small footprint), would make a nice addition to a Flash drive toolbox. The following tools have been specifically designed to help skilled users better identify malware infections and then, eradicate those specific infections. These tools require advanced computer knowledge – unless you feel confident in your diagnostic skills, you should avoid them. Should you choose to add these applications to your antimalware toolbox, be aware that you will need the latest updated version for maximum efficiency. HijackThis is a free utility which heuristically scans your computer to find settings that may have been changed by homepage hijackers, spyware, other malware, or even unwanted programs. In addition to this scan and remove capability HijackThis comes with several tools useful in manually removing malware from a computer. The program doesn’t target specific programs, but instead it analyses registry and file settings, and then targets the methods used by cyber-crooks. After you scan your computer, HijackThis creates a report, and a log file (if you choose to do so), with the results of the scan. Microsoft Rootkit Revealer is an advanced root kit detection utility. Its output lists Registry and file system API discrepancies that may indicate the presence of a user-mode or kernel-mode rootkit. According to Microsoft, Rootkit Revealer successfully detects all persistent rootkits published at http://www.rootkit.com, including AFX, Vanquish and Hacker Defender. Tizer Rootkit Razor, will allow you to identify and remove Rootkits from your computer. I should be clear however, this tool is not “one-click simple” to decipher, and users need to be particularly mindful of false positives. 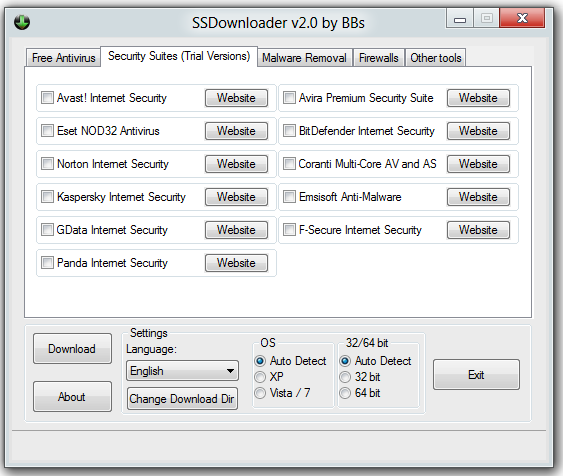 Security Software Downloader (SSDownloader) – now in it’s second version – is a tiny open source executable (669KB) – designed specifically as a bulk downloader which focuses on security applications and, security related specialty tools. 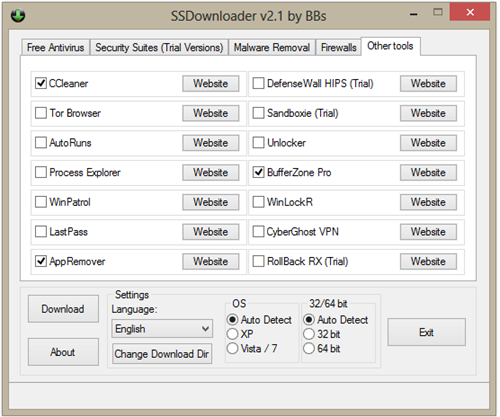 In my estimation SSDownloader is a terrific portable tool – although, I don’t see much of a need for it unless one is geek inclined. 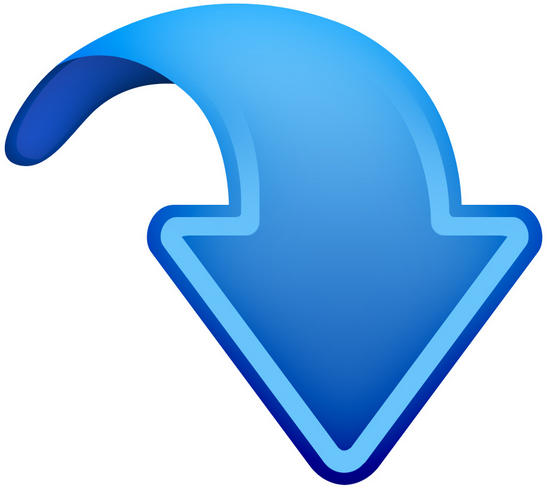 But, for those of us who are geek inclined, SSDownloader (especially given its small footprint), would make a nice addition to a Flash drive toolbox. The following tools have been specifically designed to help users better identify malware infections, and then eradicate those specific infections. These tools require advanced computer knowledge, and unless you feel confident in your diagnostic skills, you should avoid them. Here’s a reasonable test to determine if you have the skills necessary to use these application effectively. If you’re not capable of using, and interpreting, an application such as HiJackThis for example, it is unlikely that using these applications will prove to be beneficial. On the other hand, if you can interpret the results of a HiJackThis scan, you’re probably “good to go”. This article was originally posted November 2, 2010.